During Madonna’s recent visit to India, little did people know of her secret getaway to the villages of Rohet and Luni, near Jodhpur. Rohet Garh and Fort Chanwa Luni, Madonna’s village retreats, qualify as some of the most luxurious places to stay within the environment of a village. Ever wondered why many of us want to become celebrities? The glamour, fame, recognition, brands they own, the fast cars they drive, their faces in every newspaper and on magazine covers, the money they make, the love of the people who idolise them—their lives are nothing less than extraordinary. That’s precisely the reason why we show such elevated interest in their lives; to us, our lives are too ordinary. But even celebrities nurture the desire of living an ordinary life (well, maybe just a little bit), because they pay a heavy price for their fame and name—their privacy. Their personal lives, much like ours, are something they prefer to keep guarded. They seek isolation from the crowds every now and then, and where better than a rural location for that? A balance between revelling in luxury and simultaneously being able to explore the true, unseen culture of a destination or the way the villagers live is now becoming a reality. 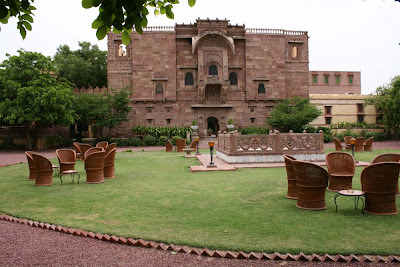 Enter Rohet and Luni, relatively unknown villages located on the outskirts of Jodhpur city in Rajasthan, where relics of the past have been converted into modern luxury mansions. On her recent visit to India, Madonna was one of the many celebrities who chose Rohet Garh and Fort Chanwa Luni as her secret getaways. 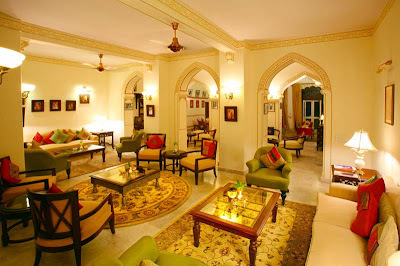 A stay in Rohet Garh means experiencing all things royal. So at your arrival, when there are several turbaned men and women waiting outside the gate with folk dancers and musicians performing amid grand fanfare, don’t look around—all this fuss is being made specially to welcome you. What else can make you feel like royalty more than a procession-like welcome? If you thought that the desert is all Rohet village has in the name of nature, think again. As you enter the premises, peacocks let their feathers out and gleefully prance around adding to the vibrancy of the ambiance. The 34 personally-decorated rooms are replete with colourful traditionally-designed frescoes on the walls, bed-sheets and cushion covers bearing Rajasthani prints and modern bathrooms; some rooms even have personal swings! The restaurant here serves mouth-watering Rajasthani delicacies made by chefs who’ve been specially trained by the late Thakurani Sahiba, who has authored Cuisine of Rohet Garh and Quick and Easy Rajasthani Cuisine; the former, in fact, was published due to popular demand from visiting guests. The property also houses modern luxurious amenities such as a swimming pool, a lounge area, sprawling lawns, serene verandahs, spacious pavilions and terraces to unwind at. This luxurious property has existed since time immemorial and holds historic relevance. My curiosity led the kind hosts to take me to their room at the property and through a visual representation that puts together pieces of an era gone by, depicting the story of this ancestral home. It was conferred upon the first amongst their kin, Thakur Dalpat Singh I, in 1622 AD for the courage and bravery he embodied in the many military campaigns under the banner of the Rathores. Through generations, this home has been a loyal bystander to the family in its good and bad times, and now it’s the face of Rohet’s rich culture and lives to tell its story. However, Madonna is not the only person of her stature to have discovered Rohet Garh. Literary stalwarts Bruce Chatwin and William Dalrymple practically lived at Rohet Garh for several months at a stretch working on their respective books, The Songlines and The City of Djinns. Patrick French, Simon Winchester and Jeffery Morehouse have also explored this hidden retreat. Be warned though, with the intriguingly diverse activities that you can indulge in at Rohet Garh, you may not want to return home. Royal picnics are only the beginning of the pampering programme. You could even opt for watching up to 200 different species of birds while sitting by the many lakes around Rohet, or head out to the wilderness camp where seven luxurious teakwood tents are laid out in the midst of the sandy wilderness. You could even avail of Madonna’s personal choice—the extensive tailor-made equestrian programme that ranges from a full day’s riding to a six days’/six nights’ riding safari surveying the various areas around Rohet. But if true village life raises your curiosity, then take a village safari, where you can glimpse into the simple lives the locals lead and witness their traditional customs and ceremonies. Tall, colossal iron gates mark your entry into this ancient fortress. The sheer size and build of this architectural marvel is vividly reminiscent of scenes from Bollywood epics centred on historic themes. Largely untouched by the mechanisms of renovation, Fort Chanwa has been a popular location for film and television shoots. Carved out of the red sandstone that Jodhpur is known for, the fort is replete with ornate lattice work friezes, intricate jharokas, courtyards, towers, waterwheels, stables, passages and rooftops with panoramic views. Many of the 31 uniquely decorated rooms are placed in secret pavilions that appear as if out of nowhere, and, along with the unexpected stairways located around, lend a touch of mystery. Elegant four-poster beds, long flowing curtains, Rajasthani paintings made by local artisans, quaint lamps and ethnic furnishings speak of a bygone era. The one thing that you must not miss is an interesting creation preserved from the olden days—the water purifier. 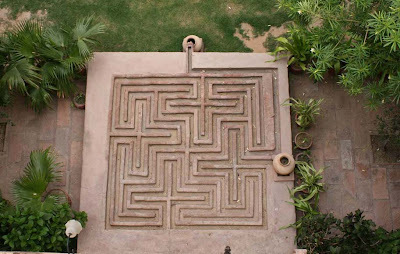 A retro ‘Aquaguard’ system, it’s made of stone and looks more like a maze. Water used to be poured from one end and would get filtered of any impurities or dirt via the various turns it would take, after which it would reach the other end where a bucket was kept to be filled. You can relax in the blue waters of the large swimming pool and have the kind staff serve you your favourite drink. For people with more refined tastes, there’s golf, horseback riding and camel safaris, whereas for the quintessential traveller a day out meeting and interacting with the villagers and tribals will prove to be more exciting. The village safari here will give you the opportunity to meet people from different communities such as Bishnois, weavers (called Prajapats), who will demonstrate weaving charpoys in their homes, and potters (called Moilas). Some locals also introduce you to the many customs and traditions followed here. I was specially intrigued by the opium consuming tradition. According to the villagers, opium is consumed (in extremely mild concentrations) at any and every celebration; it’s to mark a happy occasion. To truly enjoy an authentic Rajasthani meal, guests here are served in typical rural style with traditional ceremonies arranged before the meal, followed by local entertainment and folk dances, usually in the evening. Although the now famous black buck was popularised in a negative way by Salman Khan’s hunting escapade, guests are taken for sightings of black buck, chinkara and blue bull antelopes in open jeeps. Published in Andpersand magazine, January, 2009 issue.